U.S. companies earned profits at an annual rate of $1.659 trillion in the third quarter, according to a Commerce Department report released Tuesday. In non-inflation adjusted terms, this is the highest figure since the government started keeping track over 60 years ago. Since the credit crisis ended, many businesses have resumed growing profits but not with creating more jobs. The unemployment rate remained unchanged at 9.6% in October with 14.8 million persons unemployed according to official figures. “Campbell, the worldâ€™s largest soup maker, DuPont Co., the third-biggest U.S. chemical maker, and United Parcel Service Inc., the worldâ€™s largest package-delivery business, are asking workers to help save cash by working smarter with existing technology. A potential cost: Efficiency gains reduce the chances recession-casualty jobs will come back. â€œWhen the productivity growth comes, then watch out because that is when companies start not needing so much labor,â€ Edmund Phelps, a Columbia University economist and Nobel laureate, said in an interview. It represented 11.2% of G.D.P. last quarter, a figure that has also been growing for seven consecutive quarters. So for the past seven quarters companies have been earning higher profits with almost no hiring of workers since the unemployment remains stubbornly high at around 10%. “AMERICANS used to love to hear tales of success in business. One of the many oddities of the current joyless economic recovery is that this traditional enthusiasm is strikingly lacking. 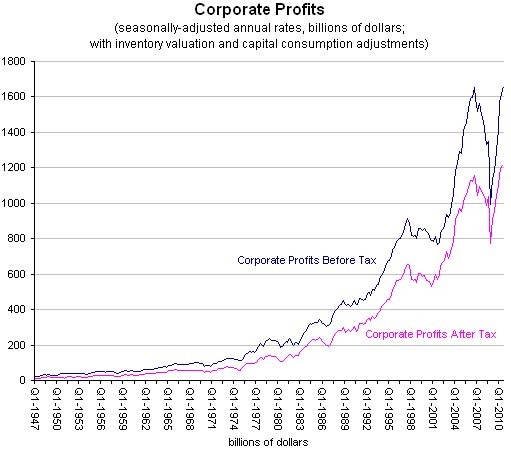 Corporate America has bounced back impressively. The quarterly results season that is now nearly over has revealed that profits are back within a whisker of the all-time highs achieved before the downturn in late 2008. By some calculations, the rate of recovery of profits from their trough is the strongest since the end of the Great Depression. Yes indeed. There is a huge disconnect between rising corporate earnings and job growth. This recovery is not only a “jobless recovery” but also a “joyless recovery”. According to S&P, non-financial companies in the S&P 500 held over $1 Trillions in cash at the end of first quarter. Much of this cash is not getting paid out as higher dividends to investors or being spent on capital investments. 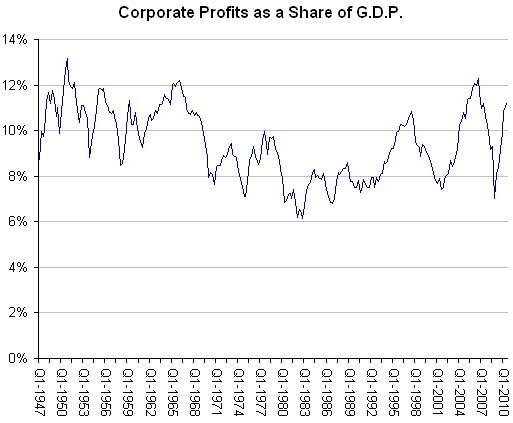 It remains to be unseen how longer this phenomenon of rising corporate profits with no increase in employment numbers can continue.